If you've been visiting my blog over the past few days, you may have seen me post a few times about So Lo La' Deals, a brand new daily deal site. There are quite a few great deals going on right now, and I promise, there are lots of awesome ones lined up for the coming weeks! So Lo La Deals is a daily deal site founded by consumers just like you who want to get a good deal. We believe that buying together helps everyone save, and allows us to negotiate costs with businesses. We also want to bring you the deals that YOU want, not just what we think you want! Thanks to our sponsors, So Lo La Deals, Saving and More, and Debt Free Spending for setting up this giveaway! 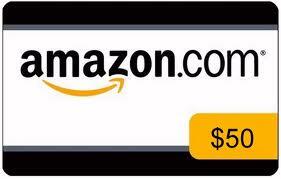 One lucky reader will win a $50 Amazon gift card! Good luck! MANDATORY ENTRY: Create a So Lo La' Deals account here. Use the Rafflecopter form below to record your entry and do the optional ones if you like. THANK U FOR THIS AWESOME AWESOME GIVEAWAY!!!! I AM EXCITED!!!!!!! I just hope that it's not effecting my chances??? Thanks!!!! Great giveaway! Thx for the chance! After many failed attempts to catch his first FISH. My 8 yr old Evan stated : "I WANT TO CATCH IT, CLEAN IT AND EAT IT". Unrelentless this summer I will make it happen. Amazon has great fishing gear that I have my eye on. This would sure help. Great giveway. Thank you for the giveaway...I could get my husband an extra b-day gift with this prize. Thanks for the chance at winning. ladyvon at grm dot net.